I recently purchased some etching supplies for a custom order of an etched design. Etching is a technique that has been on my wish list for quite some time but I always found another more important supply item to spend my hard earned dollars on, but now, having bought the items for a custom order, I am now able to expand my range to include designs that I have wanted to try for over 12 months. New possibilities appear on the horizon and I am excited to get moving in this side direction. 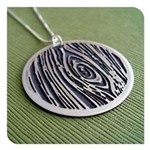 I have always been a great fan of etched designs and currently create a range of embossed and stamped metal clay jewellery that give the same result as etching but can be more limited in some respects. I cannot wait until I can create my own range of etched jewellery and admire the work so many artists do using etching and the detail that can be achieved. These fabulous Woodgrain pendant and Pipeworks Pendant are prime examples of how detailed and unique an etched design can be from a fabulous talented Etsy Shops.